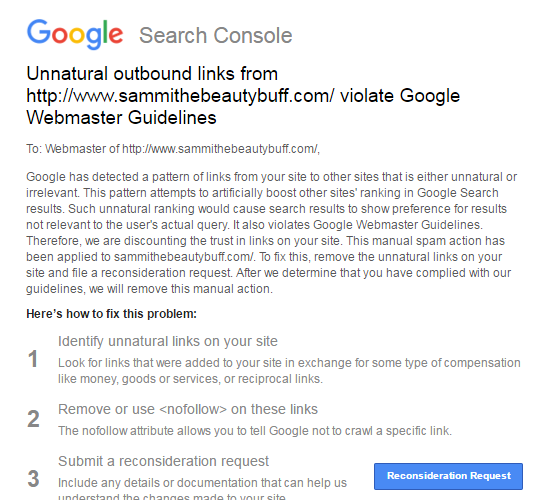 Google has started issuing messages to webmasters that their sites have been flagged for unnatural outbound links. The warning read "Unnatural outbound links from domain goes here violate Google Webmaster Guidelines." What To Do Next After You Have Received a Penalty? All those site owners who have received such messages in the webmasters console must first try and detect all such low quality outbound links on their site then they must either remove them completely or no-follow them. At last, submit a reconsideration request to Google. How to Find Out All the Outbound Links on Your Site? Download the screaming frog software from here. Run it and this will display all the outbound links your site is having. Identify all the low quality ones that can initiate Google penalty and no-follow them or remove them. Matt Cutts and Sandy Explain What It Means If Your Site Has A"Unnatural links From Your Site" Penalty and Also How to Fix it! !